We couldn't help but notice that there has been a series of news articles related to theft in the boating community over the past 48 hours. Not just in one location, but across the country. Hopefully, this week's string of news items is just a fluke, but when you combine desperate people in a struggling economy with a target-rich environment like a row of unlocked boats, nothing good could come out of it. A long stretch of nasty weather doesn't help, as the smarter thieves realize you won't be going anywhere near your boat for a while. It seemed to start Monday when a 17-year-old was charged as an adult and sentenced to jail for a series of Muskegon boat break-ins at Great Lakes Marina in Muskegon, MI. According to MLIVE.com, the kid got five months for the Christmas-time robberies. Have you seen the owner of this boat? 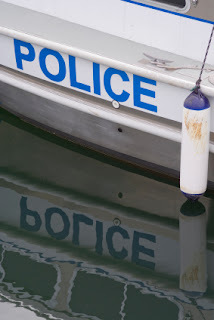 Yesterday afternoon, the Herald News reported that the Fall River Police Department is looking for assistance from the general public in identifying the owner of a stolen boat. So, they've got a crime; they've recovered the stolen property... they just need to find the victim. Oh, and it seems they also don't know who committed the crime. In Virginia, WAVY.com is reporting that boats in the East Ocean View area of Norfolk are being targeted by thieves. More than a dozen thefts of electronic devices, fishing gear and boat parts have occurred over the past two months. Meanwhile, back in Michigan, WNDU.com says that five people were arrested early Tuesday morning after they were caught breaking into boats docked at Pier 1000 Marina in Benton Harbor. Unfortunately, the reality of the day requires that you keep your boat locked when you leave it at any marina. Expensive electronics and other gear should be stowed or taken with you. A boat alarm wouldn't hurt, and make sure you have your boat and the gear you keep on it insured. Goin' Coastal This Memorial Day Weekend? Small Craft Advisory – That Means You!